Before I talk about Amish's Shiva Trilogy 1: The Immortals of Meluha, let me give you a brief personal background about this. My grandmother, while she lived, was an avid devotee of Lord Shiva and she felt His constant presence in her life in the form of "Ernakulathappan" the Shiva deity who is worshipped in Ernakulam city. She would go and pray there every morning and evening. The joy in her eyes and the excitement in her walk- it was like a woman in deep love and yes, she loved Lord Shiva more than anything. Her devotion ran deep and she tried her best to talk me into it...but the rebellious teenager I was, I have to confess here: I was totally contemptuous of the Shiva concept. I don't even know why I felt that way then. My mother is also a Shiva Bhakt. However, because of the remarkable influence of my mother and grandmother, I began researching and reading upon the Shiva concept and I began to perceive the beauty, the underlying energy that forms the essence of the concept and yes, the sheer power/shakti aspect that comes alive within Shiva. 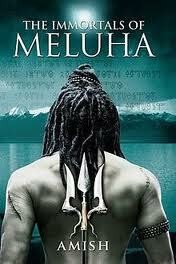 Across Twitter, many tweeps spoke highly about Amish's Shiva Trilogy 1: The Immortals of Meluha. Though late, I bought the book three weeks ago and began reading it. I like to read a book without feeling pressurized by the opinions of other readers. But this book totally turned my expectations upside down. Right from the beginning through the middle and towards the end, a reader feels on edge, wondering "Oh no, what will happen next to Shiva?" because though we may be familiar with Shiva Puran, the story makes you perceive Shiva's story with a refreshing perspective. Shiva, the warrior and chieftain of a tribe, is persuaded by the famed descendants of the Suryavanshis (who claim Lord Rama belongs to their tribe) to fight the Chandravanshis whom they say are cruel, ruthless, violent beings that conduct violent terrorist attacks on the Suryavanshis. Their belief is that the Savior who will appear and defeat evil will have a blue throat after drinking the divine drink Som Ras, and because Shiva who was given the drink, developed a blue throat. This conveys to the Suryavanshis that Shiva is indeed the Lord Neelkanth who will save them. He refuses to believe that he is Divine because of the Blue Throat but every one else completely trusts in his divine power. It is in this most unlikeliest of situations that he meets the beautiful Suryavanshi Princess Sati and he knows he has lost his heart to her. The story of Shiva is narrated with clarity and simplicity. There were times when I cringed because Shiva's character seemed to speak like 'the guy next door' and I wondered whether that could be even remotely possible. But if the author's purpose was to connect Lord Shiva's story to the youths of today, then I'd say it's worth the try. In fact, there is a line where Shiva says, "I only swear when the occasion demands it" which I felt was cheesy. But never mind, consider the larger purpose of getting iPad-crazy, tech-thinking Indians into reading about Shiva and what he represents, this is small compromise, don't you think? But there were layers of detailing that I particularly admire in this book. For instance, Daksha's manipulation of Shiva's soft corner for the beautiful Princess Sati. Even the way Shiva's non-hierarchical mindset works, the way he treats others beneath and above him with tremendous dignity and sense of equality - these are typically not qualities that we learn to associate with the Shiva concept at first instance. Also, he has endless questions about everything and a scientific, logical approach to problem solving, which convey to us more about his personality. Any kind of blind faith repels Shiva. His logical conversations with Nandi and Brihaspati are examples that will interest you while reading the book. Would you have believed that before reading this book? I am not so sure. Another equally important detail: Shiva's constant opposition of the caste division is very interesting to read as he presents logical arguments to counter the concept of caste divisions in the society. The extent of research that has gone into this is commendable and worth reading as well as analyzing. His glory and magnificence have been more austere than anything else but in this book, there's a courageous warrior we are introduced to but one who is deeply in love and yet the epitome of all that a woman would want in one who loves her and wants to woo her. The rough looking Shiva fools us because in love, he is gentle, caring, compassionate and yes, most devoted to winning the heart of the beautiful woman he loves. For example, there is a very touching conversation where a wise man tells Shiva that Sati has everything she needs but there is one thing she craves for the most and doesn't get: respect. He advises Shiva that if he treats her with respect, she will begin to love him. What a simple, profound piece of advice for men who are truly in love! And yes, the way Shiva Trilogy ended was completely unexpected. It ended at a most critical point when the reader would be gripping the book with feverish expectation to know what will happen next and Boom!, its the end. 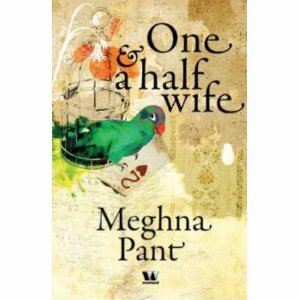 When I picked up Meghna Pant's One and a Half Wife, it is the title that evoked a curiosity in me more than the blurb that explains the story of a young Indian Immigrant girl whose Big American dream turns to ashes. To be honest, I’d say that there didn't seem to be a 'new-ness' to the way the blurb explained the story. In fact, if given a second chance, I’d suggest to the author to completely rewrite the blurb because it is plain dull and doesn't do justice to the subtle, exquisite nuances that underlines this deeply touching, well written story. Talking about nuances, I like the introduction of the story beginning with a parrot who picks up cards to predict the little girl Amara’s destiny as a ‘one and a half wife.’ The description is deeply touching and will evoke interesting memories with a distinct Indianess that all of us can relate to. The author adds a dash of subtle humor too, poking fun at the silliness of some outdated beliefs that Indian parents cling to. Guess you know now why I’m recommending this book. It’s well-crafted, warm, full of social relevance, identity crises that we all go through in life and it’s got many moments that can evoke memories lying within ourselves. Don’t miss reading this book. Amara is a good Indian girl who is groomed right from birth for the most important moment in a girl’s life. Typically, you'd have guessed what that is: the Big American Dream that would pave the way for finding the Prince. Indeed, all her struggles in life are for that. Like most Indian girls who grow up in orthodox families, Amara is taught not to argue with her parents or question their decisions about her life and especially about her marriage. With the help of Dua Uncle who is Amara’s maternal uncle, Amara’s parents finally get the Green Card and go to America. This seems to signal the culimination of all their dreams for Amara’s marriage. But this doesn’t bring them the ‘social equality’ they dream of having. For instance, Amara’s cousins, Tina and Riya, are cold, aloof and distant to her. They treat her like a stray pet that has been picked up from the street. In school too, they show no recognition they are related to her. When she makes attempts to visit them or to talk to them, they shut the door in her face. While this may have stories within itself, it also conveys how several Indians, wherever they are, carry their social biases and unique identity traits with them. The turning point in Amara’s otherwise dull existence is that when Amara gets married to the millionaire Prashant Roy. The twists, the turns and the social nuances of pretending that a marriage is fine despite the long cold, silences between a husband and wife are well punctuated within the story itself. So, what makes Meghna Pant’s treatment of ‘divorce’ different? Meghna Pant has treated Amara’s divorce as an opportunity than as a tragedy or the breakdown of a marriage that could have been made to work somehow. She portrays the social stigma associated with divorce in the Indian community but does not cease to showcase Amara’s divorce as a transition into a happier, better future. This approach is solution-oriented and practical. This contemporary accuracy and the level of detailing is what makes this book worth more than just one read. The more Amara tries to break out of her former mold, the more difficulties she faces. But one by one, she finds her way towards getting what she desires instead of what others desire. This begins Amara’s journey into the discovery of her self. One and a Half Wife: Does Amara find love? Read the book to find out. It’s worth reading. I can vouch for that. It won’t change your life or transform your unhappiness into instant joy. It offers no miracles but it gives you inner courage, the hope to move on despite the odds and the realization that every time we cross a difficult hurdle and fall, we grow new ways and methods to cross it without falling again. One and a Half Wife: What does Amara learn? Get in touch with what you desire. Then go out and do that. You are only as weak as you allow yourself to be. Your mind can be as strong as it can be delicate. It can be both a flower and a rock. So learn to define yourself. That's a refreshing, jovial and vibrant way of narrating a reading spirit.I loved the book too.Needless to say,I don't know yet am deserving,am a Siva devotee too.It's a different feeling and different perspective though. As you mentioned here,the kind of equality and complete no to caste is what he is all in here. Btw ,he is been known as 'Vairagi' no ? The one who is beyond any of such feel.That's what all about. And the way you feel why you have revolted in teenage ? lol the answer is it's to be so.Then only the second part comes.Isn't it ? Grandma was in her third or fourth stage..We don't have to expect it other way..Everything is for good.No lovely Swapna ? read this and some how this book will be more disappointment. I don't know why it's catching popularity, maybe due to its interesting theme. But, boy oh boy, this is one awful book. It is so poorly written that I had to drag myself to 200 pages and then just said: "God!! Stop this." It almost felt like some school kid had written it. No suspense. No character development. It almost felt like I was seeing some 2-star IMDB rated movie. Please do also have a look at my website, www.clarkprasad.com. Thank you for your time to read this post. Amazing Book to read , while reading it takes us with its flow , feels like its a movie. Excellenty written . This was my first book from flipkart and the delivery was quick. I think a TV SERIES on this Book and its sequel The Secret Of The Nagas will be a great hit. One of my friend recommended this book and while reading I was so lost in it that I didn't realized I was on the last page. The ending of the book leaves you with curiosity to quickly jump to the next part. Same with the 2nd part "The Secret of Nagas"... Now I can't wait to get my hands on the last piece of the triology. The books is so brilliantly written that it truly deserves the title "Master Piece"